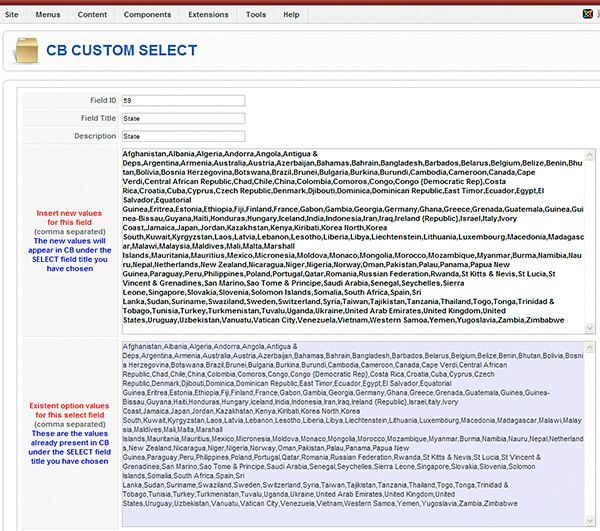 - allows the extension of a CB 'select' field from a CSV list - version 1.5.2 adds a sample list of countries. 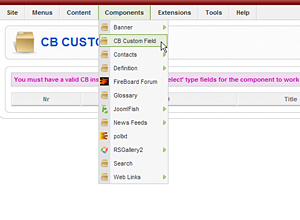 If you are using Community Builder on your Joomla site then you must have stumbled more than once into having to define long option lists for the select fields of the registration form. It took me almost two hours to fill the fields for a drop-down containing a list of countries (which I already had in CSV format), so I decided I should correct the shortcoming of this otherwise great component by adding an easier way of building ‘select’ drop-downs. The result is here – all you have to do is upload the zip-archive with Joomla's Component Installer (and of course you must install Community Builder first).